Or, get creative and DIY some double (or triple or more) features in a single package for your favorite movie buff. And if you still have trouble coming up with ideas, remember the best gift is the one you'd like to receive yourself. In which case, Santa, if you're reading this, we'd love the Universal Monsters set, pretty please. 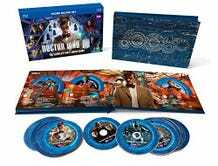 Contains both DVD and Blu-ray versions of the first three seasons, plus a special-features disc in both formats, with behind-the-scenes featurettes and more (two words: Sherlock bloopers.) 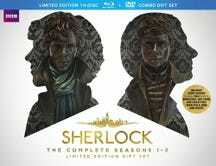 Bells and whistles include two "art cards" and two mini-busts of Sherlock and Watson. $197.50 on Amazon. Preserved in pristine Blu-ray: every one of Michael Myers' blood-soaked visits to Haddonfield, including the ones filmed by Rob Zombie. Fortunately, the Carpenter era gets most of the shine. The insanely long list of extras includes multiple audio commentaries (at least one per movie; some boast more, and many are brand-new to this set) plus an entire disc of bonus features. $169.99 at Amazon. This lavish set technically came out in 2013, but with all the hype about the upcoming next James Bond film, there's no time like now to pick up this set for the secret agent wannabe on your list. Contains every film including Skyfall, and lots of extra features. $299.99 at Amazon. 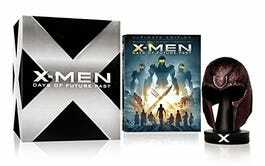 You get the Blu-ray of the movie, plus a model of Magneto's helmet. (Michael Fassbender not included.) $129.99 at Amazon. Here we have a set that doesn't even bother to mention the movie in its product description. Ahem. The gift-ability comes in the form of a figure depicting Optimus Prime riding Grimlock, with "hand-painting" that emphasizes "Optimus' flame-detailed chest and forearms" and "Grimlock's fiery, glowing eyes." $119.99 at Amazon. 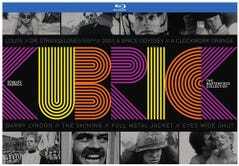 Hot damn, this is a good one: Blu-rays of eight Kubrick classics (wild card entry: the slowly-gaining-in-cult-popularity Eyes Wide Shut), plus three docs and a hardcover photo book. $199.99 at Amazon. The gang's all here in this sweet set of all 30 Universal Monster films, from 1931's Dracula and Frankenstein through 1956's The Creature Walks Among Us. Bonus features include the 1931 Spanish-language version of Dracula. $199.98 at Amazon. 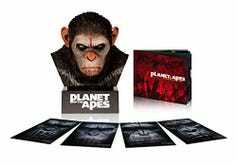 For that fan of the Apes series reboot crossing his or her hairy fingers hoping for an Andy Serkis Oscar nomination, this is the perfect gift. 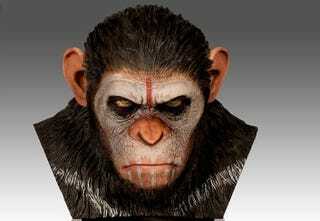 Comes with DVDs and Blu-rays of both the Rise and Dawn films, plus a bust of Caesar in full "damn dirty humans!" glower. $129.99 at Amazon. A box set as vast as space and as timeless as infinity. Contains the entire original Zone and the 1980s series, plus lots of Rod Serling-centric bonus features, totaling a shelf-busting 41 DVDs. $349.98 at Amazon. Did somebody say binge-watch? Sookie and company live on with vampire-like tenacity via the magic of Blu-ray. (There's also a buy-it-separately DVD version.) $299.99 at Amazon. Holy stocking stuffer! On the off chance that the Bat-fanatic in your life didn't pre-order this long-awaited, much-pined-after Blu-ray release, this has "perfect gift" written all over it. 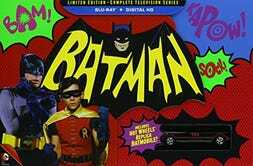 Just look at that adorable li'l Batmobile Hot Wheels toy (which is not included in the also-available DVD set). 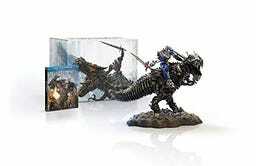 $269.97 at Amazon. Is David Lynch's Twin Peaks the most cult-beloved TV show of all time? This set of 10 Blu-ray discs contains the entire series, bonus features, and the underrated Fire Walk With Me film. With the show returning to the airwaves in 2016, there's no better time to share the wonders of the Black Lodge, the Log Lady, and a damn fine cup of coffee with someone on your gift-giving list. $134.99 at Amazon. If you get 'em this, might as well really rock their world and toss in Doctor Who: The David Tennant Collection Bundle, too. Smith is $148.95 at Amazon; Tennant is $227.99 at Amazon. Scifi or horror Pee-wee Herman is not. However, what he is ... is awesome. This box contains the entire series, plus some enticing-sounding bonus features focusing on the show's set design, puppets (Chairry forever! ), supporting cast, and music. $149.99 at Amazon. Look, you already have that Dancing Baby Groot wrapped and ready. Why not throw in a Blu-ray (or DVD) of their favorite movie of 2014, too? $39.99 at Amazon. Another 2014 release worth revisiting. And while you're at it, why not also gift 'em with one of the many Japanese G-man single-package double features that are floating around out there, like this one? $35.99 at Amazon. For under ten bucks, you get four solid midnight-movie monster classics: 20 Million Miles to Earth, The Giant Claw (pictured), It Came From Beneath the Sea, and Mothra. Can't go wrong with any of these titles. Can't even really pick a favorite, though obviously Mothra is a thing of beauty, and The Giant Claw is as singularly bizarre as they come. $9.98 (!!) at Amazon. Pick up this set of all six Leprechaun films (he chases Jennifer Aniston! He goes to space! He goes to the 'hood ... and then he goes back 2 tha hood! ), and watch the fists fly at your next White Elephant gift exchange. $24.99 at Amazon. Who needs green when there's so much red splattering around? Delight your favorite horror hound with this Something Weird release, featuring three of the "Godfather of Gore"'s most memorable low-budget, high-body-count masterpieces: Blood Feast, Two Thousand Maniacs!, and Color Me Blood Red. $17.97 at Amazon. Do you wanna par-tay? Snap up this 1980s comedy-horror cult fave for the Walking Dead fan who needs a smidge more goofy humor (and punk rock) in his or her life. $19.99 at Amazon. A win-win-win set (Logan's Run, The Omega Man, and Soylent Green) for the budget-conscious, future-paranoid gift-giver. Makes the perfect present for Charlton Heston fans, or any 29-year-olds you happen to know. $19.98 at Amazon.